Preheat the oven to 350°F. To make the filling, mix the pumpkin, brown sugar, spices and heavy cream in a bowl. Unroll the pre-made dough on a flat surface. There are two in one box. Using a 2 1/2 inch biscuit cutter, cut out at least 18 circles. Roll the extra dough out and cut some more with the biscuit cutter. Cover a cookie sheet with parchment paper. Place 9 dough circles on the parchment paper. Add in about a tablespoon pie filling, then place a dough circle on top. Press together with your fingers to seal them. Then use a fork to get a nice edge. Whisk one egg in a small bowl and then brush on top of the dough. Sprinkle with cinnamon and sugar. Bake for about 20 minutes or until golden brown. Top with yummy whipped cream and serve with ice cream! Move over, full-size pumpkin pie – because I've got a crazy easy recipe for mini pumpkin pies that are just as good! I have a secret: These Mini Pumpkin Pies are easier to make and serve than a full-size pie. In fact, once they're done they're self-serve! 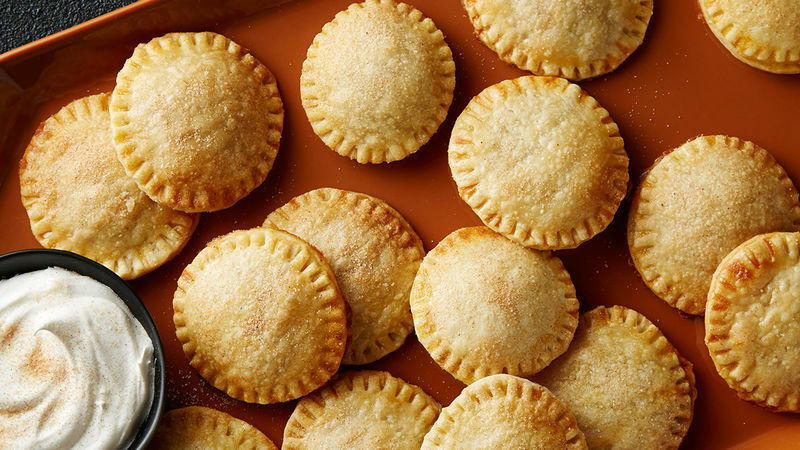 And they're so easy to make using Pillsbury's delicious pie crust. Because let's be real – it's not always convenient to make your own. I love bite-sized desserts that are easy to make, and these have me getting into the fall spirit. But be warned, they're definitely a dessert you can't stop eating. My mother and I ate ALL of these individual pies – with a side of ice cream and topped with rich, vanilla whipped cream. So good!! Top with yummy whipped cream and serve with ice cream! These are a wonderful Thanksgiving or fall dessert buffet idea!